…The original film was written and directed by Stuart Schulberg, and edited by Joseph Zigman, under the aegis of Pare Lorentz, chief of Film/Theatre/Music at the U.S. War Department, and completed by Schulberg in 1948, under the aegis of Eric Pommer, chief of the Motion Picture Branch of U.S. Military Government in Berlin. If you have the chance to see a screening of the film, I encourage you to do so. If you’re lucky, producer Sandra Schulberg (whose father Stuart wrote and directed the film) will be there to answer questions and give insights into the film’s creation. I thought I would share three particularly fascinating tid-bits of information Schulberg shared with the audience. While this site is dedicated to the politics of international criminal justice, the examples clearly demonstrate that there is much to be said about the politics of recording and depicting international criminal justice. For decades after it was made, the film wasn’t shown in the US. Many believe this was because by the late 1940s, when the film would have been screened in America, the US government did not want to be seen to be cooperating with the USSR (which it did at the Nuremberg tribunal). In the context of the emerging Cold War and the onset of the red scare, showing a film which depicted the US and the USSR as allies working together as the keepers of international law would have gone against the prevailing political winds in America of the USSR as enemy number one. Others believe that Konrad Adenauer, the first democratically elected German Chancellor post-WWII, made a personal plea to the US not to show the film given that it does a particularly poor job distinguishing between Nazis and Germans. Still others maintain that the film wasn’t shown as a result of opposition from high-level US military officials who had opposed the trials from their conception because they prosecuted military officers. The film was intended for German audiences. 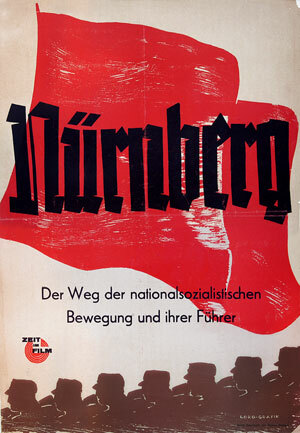 Yet, while it was still officially entitled “Nuremberg: Its Lessons for Today”, rather remarkably the film’s by-line on German-language posters from 1948 read: “The Path of National Socialism and Your Führer”. 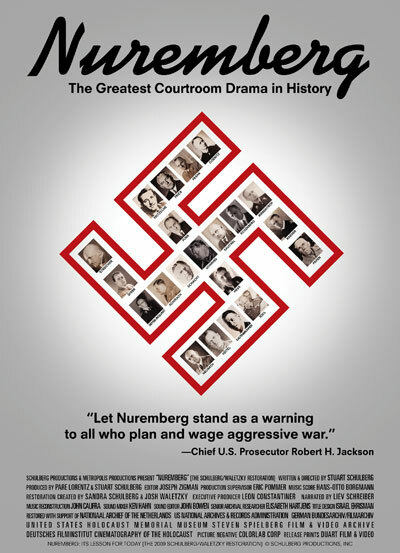 Moreover, the poster said nothing nor visually hinted at what the film was actually about – the trial and prosecution of the surviving Nazi leadership. The film’s makers believed that employing this strategy would attract those who had escaped de-Nazification and still supported the Nazis. The audience would subsequently be forced to witness images of the war and genocide, see the surviving Nazi leadership in the dock and, towards the end of the film, hear many key Nazi leaders admit to some of the worst horrors of WWII and the Holocaust. According to Schulberg, it worked. Lastly, according to Schulberg, only forty hours of the actual trials were filmed. Moreover, the film-makers were specifically banned from filming some parts of the trial. Schulberg explained that it was forbidden to film the reactions of the defendants to their sentencing. Similarly, the hangings of those who received the death penalty (Hans Frank, Wilhelm Frick, Alred Jodl, Ernst Kaltenbrunner, Wilhelm Keitel, Alfred Rosenberg, Fritz Saukel, Arthur Seyss-Inquart and Julius Streicher)* were not allowed to be filmed. However, still shots of their dead bodies were taken and released in order to prove to any doubters in the public that the former Nazi leaders had indeed been killed. I couldn’t help but be reminded of the assassination of Osama bin Laden. As readers will recall, there is a set of photographs on bin Laden’s body that were taken by US special operatives in charge of the operation to kill him. However, unlike at Nuremberg, those photos have never been released on direct order from President Obama. * Hermann Göring also received the death penalty but managed to commit suicide prior to his hanging. This entry was posted in Film, Holocaust, Nuremberg, Nuremberg Trials. Bookmark the permalink.